Animation Director/Producer. 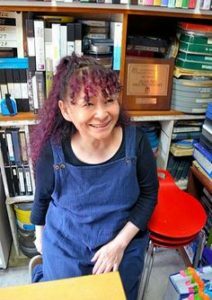 Sayoko has been making independent animation documentary shorts together with her partner Renzo Kinoshita, such as “Made in Japan”(’72), “Japonese”(’77), “Pica Don” (’78), “The Last Air Raid- Kumagaya”(’93), “Ryukyu Okoku – Made in Okinawa” (’04) , receiving Grand Prix and many international prizes. Also, since late 1960s, she has been working for the development of animation art, including education, research and promotion. In 1985, she founded the first international animation festival in Asia, in Hiroshima, endorsed by ASIFA, and has been the Festival Director since then. ASIFA President from 2006 to 2009. She is now ASIFA Vice-President, ASIFA-Japan President, Advisor to Japan Society of Animation Studies, Visiting Professor at Osaka Univ. of Arts, Board of Joshibi Univ. of Art and Design, President of Int’l Animation Library, President of Studio Lotus.